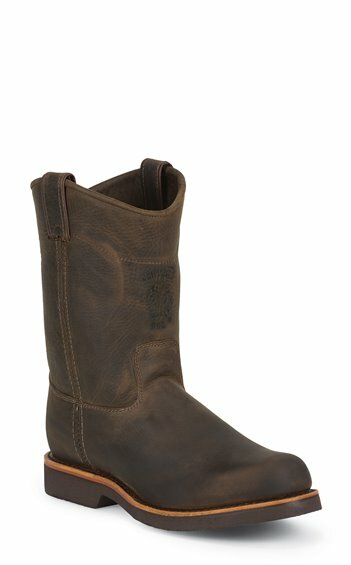 The Corbin Pull On Steel Toe Chocolate 10-inch tall men's boot has both simplicity and convenience. Its chocolate brown leather exterior is durable and crafted from quality for extended wear. The steel safety toe cap meets or exceeds ASTM F2413-11 standards for impact and compression and guarantees non-electrical conduction of electrical potential or magnetic charges. It has 5 Iron Texon® insoles that allow for a relaxed and comfortable fit and the fiberglass shank offers stability. This boot features a Vibram® outsole that provides maximum traction on wet or dry surfaces and various terrain. Made in the USA with global parts. Bought these about a month ago looking for a boot that was comfortable, stylish, and useful. These hit the mark right on!! I've never worn a field boot like these. A definite MUST BUY!!! Very disappointed in this product, I purchased a pair of the Apache 10" steel toe in August and they leak extremely bad after walking through minimum abouts of water,. I understand these boots are mad of leather and aren't water proof but they should atleast be somewhat water resistant, especally since I paid $240 for them and they are barely 3months old. I've had Justin's, Ariat, and redwing in the past and have never had this problem before. This is my first and last pair of chippawa boots. Impulse buy gone good. Made in the USA. Even better impulse buy. I have worn my US made Chippewas each day to work, 6 days a week, 10-14 hours per day. Most of my day is on my feet. I got a year on the original soles and 8 months on the replacement soles. They are going back in the shop for third set of soles. Very durable, material resists scratches and scuffs. Well worth the money.